The X77 is a coach/bus hybrid connecting Scotland's biggest city with Robbie Burns' hometown by the sea. See a full route map here. It runs every 30 minutes Mon-Sat daytimes and hourly evenings and Sundays. There is also an hourly all-night service on Friday and Saturday nights. Click here to discover other bus routes in Scotland. The section between Glasgow and Kilmarnock also has route X76 which combines with the X77 to give a higher combined frequency. They are both operated by Stagecoach. Scotland's first parliament was held in Ayr. 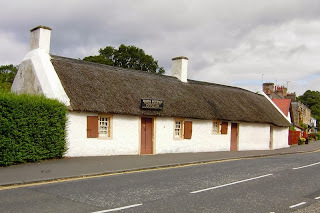 But it is probably even better known for being the birthplace of the poet Robbie Burns. You can even visit the cottage where he was born. There's not just a cottage, but also a museum nearby. To get to the museum, use Stagecoach 8 from Ayr High Street, but note the different route numbers in use in the evenings and on Sundays. The blue star is Ayr bus station. Prestwick was once a separate town but is now a suburb of Ayr. It's best known for its airport, which goes by the name of Glasgow Prestwick. The X77 only serves Kilmarnock in the evenings and very early on Saturday mornings. During the day, Kilmarnock is connected to Glasgow by the X76. The town is known for being the birthplace of Johnnie Walker whisky. While here, why not visit Dean Castle Country Park? Fenwick is a tiny village, famous for its Weavers' Society, regarded by many as the world's first co-operative. It's a lot prettier than Rochdale, I'll give it that! It lies just before the end of the M77 motorway, which the X77 takes all the way to Glasgow. As an alternative, Stagecoach route 4 runs through the village centre, but it takes longer to get to Glasgow than the X77 does. Glasgow City Chambers. Image by Kim Traynor, published on Wikipedia and used under creative commons. All other journeys serve Buchanan Bus Station, one of the biggest in the country. The X77 leaves from stance 4. You can see the full timetable for the X77 on Stagecoach's website. The only day ticket that really allows you to explore the towns along the X77's route is the SPT Daytripper. It's valid after 9am weekdays and all day at weekends and gives you complete freedom of all trains and most buses (including those of Stagecoach, who run the X77) plus the Glasgow Subway in the area shown on this map, which includes the whole of route X77. It costs £11.20 for one adult and up to two children or £19.80 for two adults and up to four children. It can't be bought on the bus though, only from staffed rail stations, online or from SPT Travel Centres, including the one at Buchanan Bus Station in Glasgow. Single and return fares are available to buy on the bus. Some fares are listed here. Ayr Plusbus tickets are valid on the X77 between Ayr and Prestwick Airport. It also passes near to Buchanan Street station on the Glasgow Subway. Between Ayr and Kilmarnock, you can also use routes X16, 4 and 444. Between Kilmarnock and Glasgow, you can also use routes X76 and 4. The 4 serves the full length of the X77's route, but with some variations and it doesn't use the motorway, so a journey to or from Glasgow will take a lot longer and won't cost you any less. All of these buses are operated by Stagecoach. The other alternative is the train. See the rail map above for an idea of exactly where the trains go. Find timetables here and fares here. The SPT Daytripper ticket is also valid on the train, so you could get the bus one way and return by train or vice versa. If you want to use the train only, an anytime adult single is currently £7.80, an off-peak (after 0900 weekdays) adult day return is £10.40 and an anytime adult day return is £14.00. Discover more Great Scottish Bus Routes here. great!!! For once the Public Transport is taken seriously to help passengers who are not familiar with travelling on buses and this is amazingly made clear!!! Well done!! When will more work to make travelling clear. Thankyou!! !